Nineveh - There were many great cities in ancient Mesopotamia. Perhaps the greatest was Babylon (mentioned earlier). But right along with it was Nineveh, the great city and one of the capitals of the Assyrians. Since the fall of the Akkadian Empire, the Assyrians and Babylonians vied for dominance of Mesopotamia, and both built magnificent cities to reflect their power. Ironically, each of the two capitals (located about 280 miles apart) was built along the two great rivers of Mesopotamia; Babylon on the Euphrates and Nineveh on the Tigris. Perhaps another irony is their origins. Both are mentioned way back in Genesis 10 as being founded by the great hunter, Nimrod. Despite being very old, Nineveh didn't start to thrive as a major city until Assyria began to assert its dominance early in the first millennium B.C.. From excavations done in the 19th century, it's estimated that, at its height, Nineveh had a population of around 175,000. That would have been at the time of Sennacherib (705-682 B.C.). He made Nineveh Assyria's permanent capital. Previously it had shifted between that and Ashur, Calah (or Nimrud) and Khorsabad. But Sennacherib built a mighty palace which he called the "palace which has no equal". Years later his grandson, Ashurbanipal, would build one of the great libraries of antiquity; second only to the Great Library of Alexandria. Over 20,000 clay cuneiform tablets were found, most written in Akkadian, but some in Neo-Babylonian and Assyrian. The Epic of Gilgamesh was among the works found. As it turns out, the Library of Ashurbanipal may have been responsible for the eventual creation of the Library of Alexandria. Persian tradition holds that Alexander the Great visited Nineveh while in Mesopotamia and saw the library, which inspired him to build one of his own. He did not live long enough to realize his wish, but his friend and general, Ptolemy, laid the foundations for what would become the famous library. Another interesting discovery is a bas-relief of a garden called the Garden of Sennacherib. 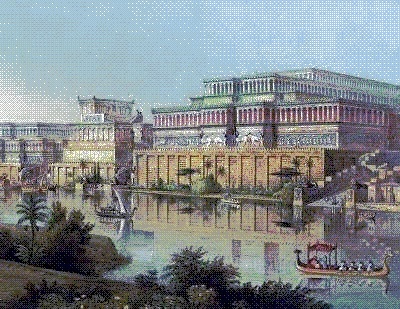 Some scholars today believe that the famous Hanging Gardens of Babylon were actually the Hanging Gardens of Nineveh. We may never have a definite answer to that.